Environmental educator Steve Brill has a special way to reach his audience and create a lasting awareness for nature around us - that special way is foraging. "To learn about the environment and get back in touch with nature. By studying foraging and nature, we enjoy our renewable resources and reaffirm our commitment to preserving and rebuilding our ecological riches." Steve Brill did his first public Central Park tour more than thirty years ago - in April of 1982. Since then he's engaged consistently with that very clear focus on foraging. By doing so, he's reached more than one generation and people who met him in childhood and now bring their children to continue the learning. 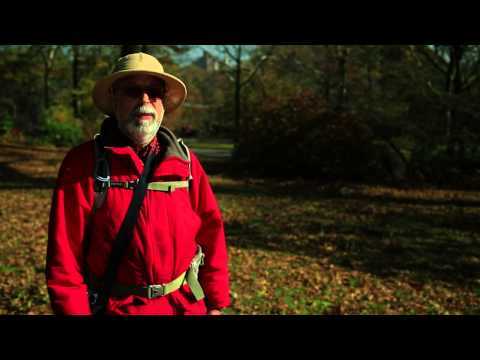 Without a doubt, Steve Brill, this one-man show, has reached thousands and the awareness he raises with every single one of his walks is one that takes hold and infuses the actions of generations to come. When I first saw this clip I smiled at this seemingly odd character with his explorer's hat. But then, listening to him, I realized that what he does is exactly what everyone says we must do - educate! Over the past years I've heard, seen and read so much about climate change, about sustainability, about the environment - and invariably you'll find education as a top action point. By raising awareness at every level, by making it part of every school's curriculum, we give rise to new generations with a clear understanding and an obvious purpose. Where our generation still debates rights and wrongs, environment vs economy ... the next generation will begin the conversations at a different level, a better, clearer and more sustainable level. We can only applaud people like Steve Brill - may there be countless of them! Tags: #Open Minds video, #Video, #environment, #climate change, #Sustainability, #forage, #nature. Alicia Montoya - 9 Apr 2014, 8:16 p.m. I love this. We need to get back to basics when it comes to food: Local, natural, unprocessed. And I agree that education is crucial, but so is applying one's knowledge. And the fact is, many (especially rich) people are lazy... and spoiled when it comes to food. The same people participating in a climate demonstration will then go to a fast food outlet or coffee shop chain and order processed food and drinks served in huge amounts of plastic packaging and styrofoam. So, dear fellow Earthlings, we need to comfort the world more, and ourselves less. Go the extra mile to buy wholesome, local products from producers who care about the long-term sustainability of our health, the economy and the environment. Don't settle for less or if you do, don't be surprised about the state of our planet and your health. Oh and... save yourself the demonstration. You are the problem (as much as the next guy). So act on it. Alicia Montoya - 11 Apr 2014, 6:50 a.m.